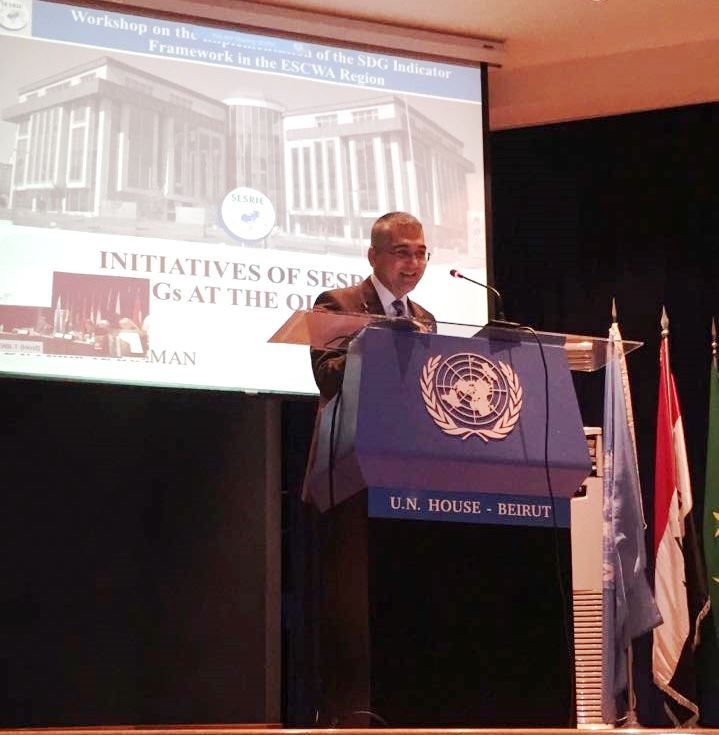 The United Nations Economic and Social Commission for Western Asia (ESCWA) in collaboration with the United Nations Statistical Division (UNSD) organised the Workshop on the Implementation of the Sustainable Development Goals (SDG) Indicator Framework on 5-6 April 2017 in Beirut, Republic of Lebanon with the participation of 13 ESCWA member countries including Egypt, Iraq, Jordan, Kuwait, Lebanon, Mauritania, Palestine, Qatar, Saudi Arabia, Sudan, Syria, Tunisia, and Yemen and regional and international agencies including GCCStat, ILO, SESRIC, UNDP, UNEP, UNESCO, UNFPA, UN HABITAT, UNICEF, UN Resident Coordinator’s Office, UN Women, and WHO. Dr. Atilla Karaman, Researcher at Statistics and Information Department of SESRIC, represented the Centre thereat. The objective of the Workshop was to reflect on the preparation of national indicator frameworks based on national, regional and global priorities, on the roadmaps for the development of a clear set of strategies to strengthen national statistical systems and their deliveries in line with the Global Action Plan, and the reporting systems in support of the Agenda 2030. Under the session titled “Global Action Plan and its Translation into Regional and National Development Strategies: Other Initiatives of Entities / Partner Organizations at the Global / Regional Levels”, Dr. Atilla Karaman delivered a presentation on the “Initiatives of SESRIC on SDGs at the OIC Level” in which he informed the participants about the Centre’s SDG oriented activities that are currently covered under OIC Statistical Commission, Statistical Capacity Building (StatCaB) Programme, and the “Tendency Survey on SDG Priorities of OIC Member Countries”. The workshop also launched the ESCWA Toolkit on Gender Statistics and the 10th Tranche of the Development Account (DA 10) programme on data and statistics for ESCWA member countries. The Programme aims to strengthen national statistical systems to respond to the data challenges of the 2030 Agenda. The Programme is also expected to support national capacities of ESCWA countries to assess their internal readiness for measuring and reporting on the 17 SDGs, and defining the short– and long–term actions needed for increasing their capacities to produce accurate and timely data in a sustainable manner.